Over the past three months, bond yields and spreads have been falling across the board, no matter how high/low the credit rating is. Nonetheless, energy bond spreads are actually moving in the other way. That's particularly odd as it's happening when oil prices are soaring. Oil production is at record high, but demand seems to outweigh supply, assisting oil prices to remain buoyed. However, in order to maintain high oil prices, OPEC and its leading producers will need to agree on extending the production cuts, at the very minimum. A combination of rallying stocks and falling bond yields/spreads is unsustainable. Something's gotta give. Has US Bond Volatility Died? It certainly seems as if US bond volatility is dying. 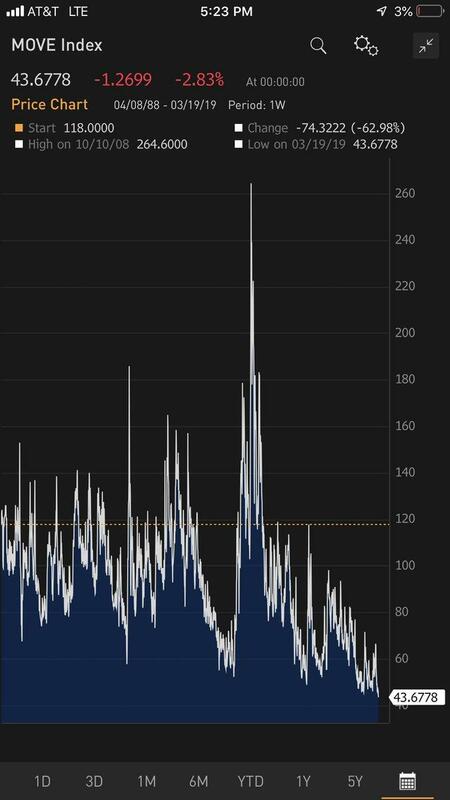 March 19th marked the lowest close for the MOVE index - that's the bond market's equivalent of the VIX Index (VXXB, TVIX, UVXY, VXX, VXXB, VIXM, VIXX, VIXY) - since it began being tracked, back in 1988. If so, this is certainly not being reflected when it comes to energy (XLE*, IYE, XOP, IXC, VDE, OIH) bonds (AGG, BND). There are still some serious potholes in debt of US oil (OIL**, USO***, DBO) and gas (UNG, UGAZ) companies. Take EP Energy (EPE) as an example. The company's bonds lost 40 cents (on the dollar) over the past two days after it reported a meaningful operating loss on asset write-downs and lower Q1 production. EPE is certainly not alone in here. 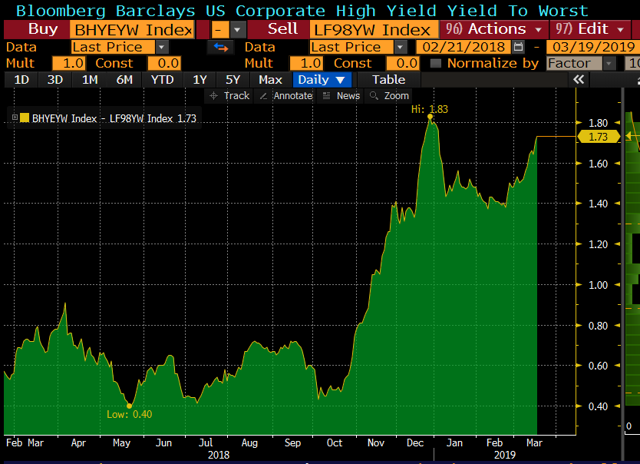 As a matter of fact, investors are now demanding the greatest premium to own HY energy debt relative to the broader junk-bond (HYG, JNK, BKLN, SJNK, SRLN, SHYG) market since December 2018. The below chart shows the change in US Corporate Option-Adjusted Spreads - across all credit ratings - since the beginning of the year. 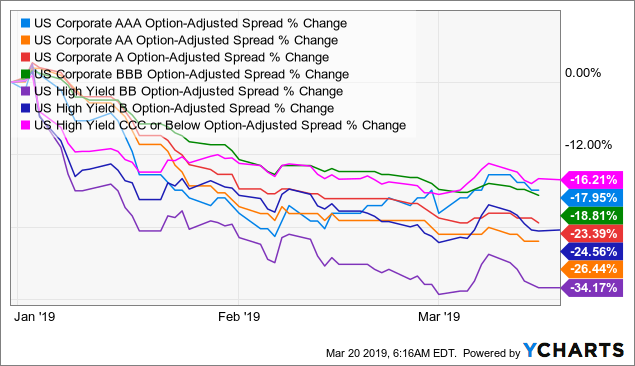 As you can see, spreads are contracting across the board, leading to bonds, high-yield and investment-grade alike, gladly participating in the "best start to a year since 1987" ongoing party. As such, the obvious-immediate question is: What's the story with energy bonds!? 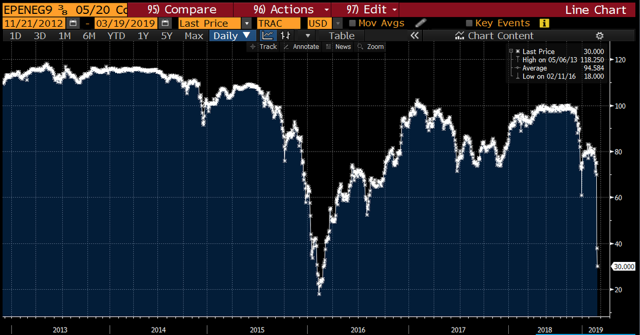 Why when bond spreads across the board are at record lows at a time when the yield curve is partially inverted, energy bond spreads are taking the opposite direction from the overall bond market (LQD, BSV, TIP, VCSH, VCIT, SHV, EMB, SHY)? 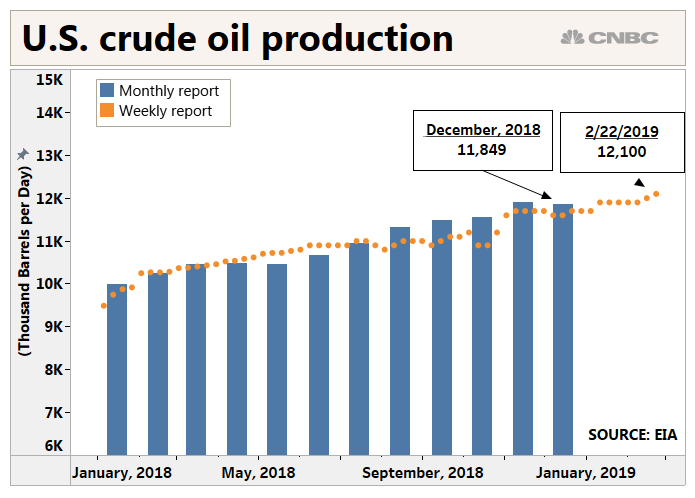 US (SPY, DIA, QQQ, IWM) oil production rose at the fastest pace on record in 2018. Same goes for the other two largest oil producers - Russia (RSX, ERUS) and Saudi Arabia (KSA). 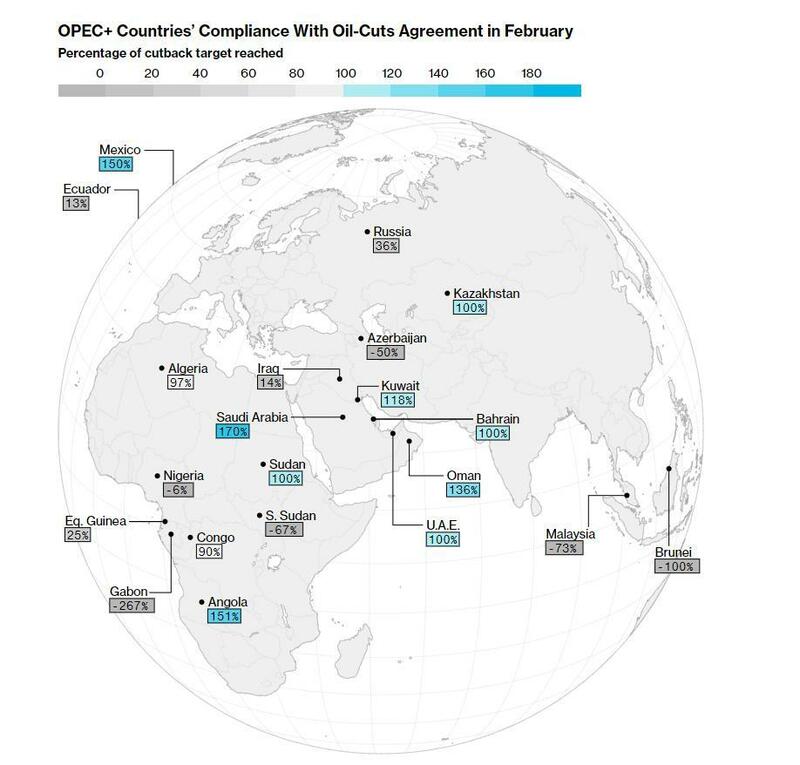 OPEC skipping on a meeting is likely a sign that the Russia-Saudi Arabia oil alliance is feeling the strain. It's now estimated that the (originally) planned April talks are likely to be canceled too, at Russia's request. 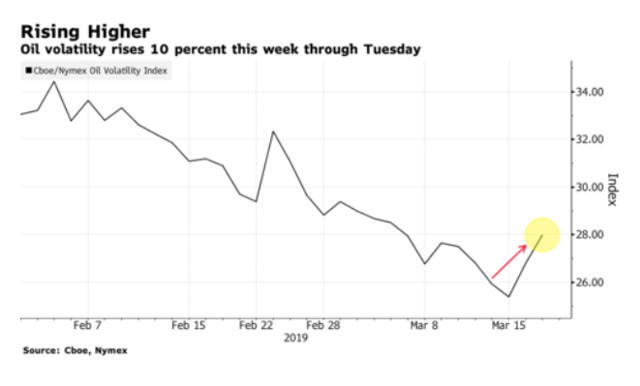 The Saudis (at least) previously favored that next month's talks will focus on extending the production cuts agreement. 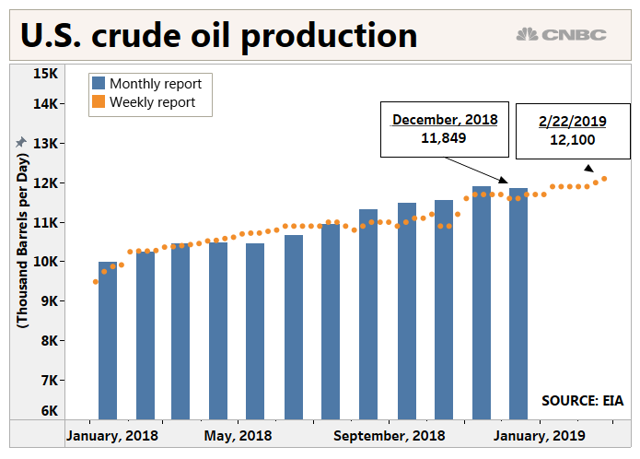 At the end of 2018, due to a weaker economic outlook, trade war/concerns, higher oil prices and a revision to Chinese (MCHI, FXI) data, the International Energy Agency ("IEA") was expecting a growth of 1.3M barrels/day ("b/d") for 2018 and 1.4M b/d for 2019 by OPEC members. 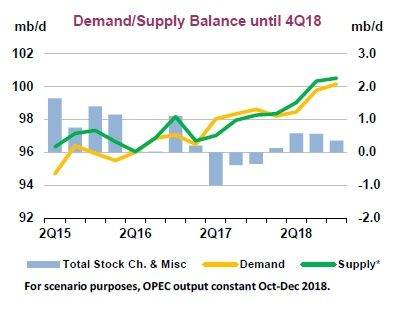 Together with the non-OPEC supply, the IEA was forecasting a total production of about 2.2M b/d, with the supply still being higher than the demand. 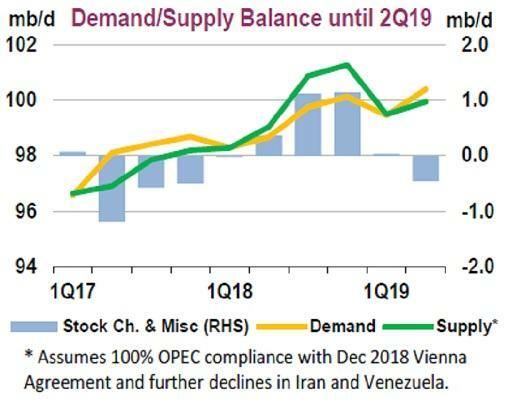 However, based on its most recent forecasts, the IEA is now seeing demand outweighing supply, even as the agency sees US crude output moving above the capacity of either Saudi Arabia or Russia around the middle of the year. Since bottoming in the low 40s, towards the end of 2018 (along the markets), oil has made a huge comeback (once again, along the markets). 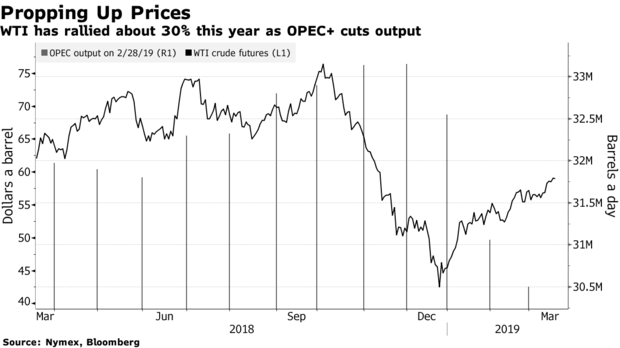 Oil holds its gains near the highest level this year after OPEC and its partners committed to continue production cuts until at least June. We expect oil to rise above $60/bbl during the first half of 2019, but not to exceed $70/bbl. As long as the "recession can" is getting kicked down the road, oil can keep its recent recovery. Oil prices are already up 20% since the December lows, and we see no reason why another similar move won't take place as soon as i) the market realizes that the oversupply fear is overblown, ii) the USD starts to weaken, and iii) the Fed is becoming more and more dovish, something that will weaken the USD and lift the prices of commodities. After all, it's a vicious circle and, whether we like it or not, everything is linked, one way or another. Having said that, the second half of 2019 is likely to be a different ball game. The slowing economy, possibly getting closer to a recession, will form a "counter-attack" on oil prices that will get torn between contradicting, powerful, forces. To make a long story short, we expect oil to trade as high as mid-high $60s, but to finish the year lower, around the $60/bbl mark. Oil's rally stalls as uncertainty over trade negotiations between the U.S. and China stoked concerns over economic growth. So far so good, but it's not enough. Oil's rally might be stalling as I write, as uncertainty over the trade negotiations between the US and China keeps stoking concerns over economic growth. It's clear that in order for oil prices to remain high, OPEC members will have to dig deeper in order to trim oil stockpiles further. 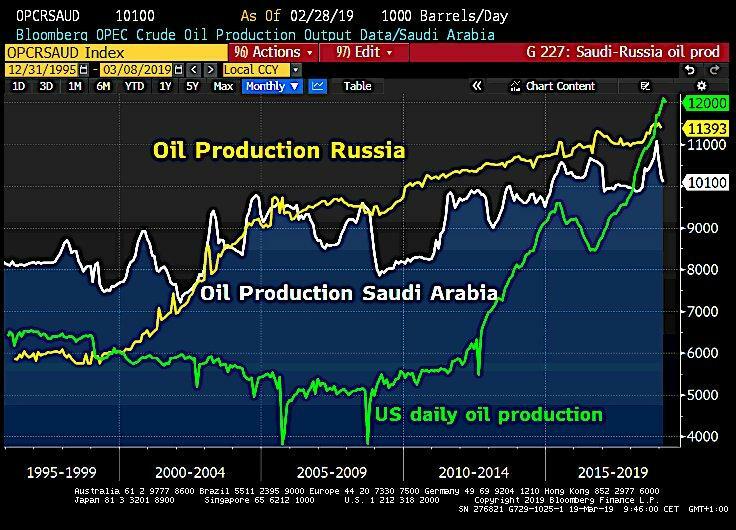 As we already outlined above, Saudi Arabia is trying to boost OPEC's oil cuts plans - and rightly so! What's the story with energy bonds!? Why when bond spreads, across the board, are at record lows, at a time when the yield curve is partially-inverted, energy bond spreads are taking the opposite direction from the overall bond market? As a matter of fact, with oil prices surging this year, this question regarding energy bond behavior is even more burning (pun intended)! As I've already outlined many times before, most recently here, bonds (AGG, BND, LQD, BSV, TLT, HYG, JNK) are a much better indicator/gauge for the health of an economy than stocks (SPY, DIA, QQQ, IWM, IVV, VTI, VOO). 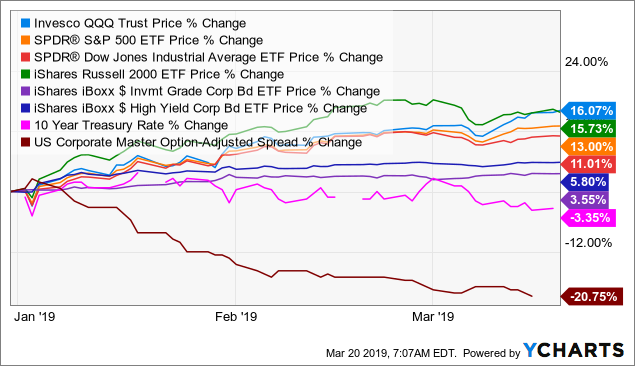 High-yield bonds moving with the ebbs and flows of US earnings announcements tend to predict stock returns for a slew of issuers, particularly firms with a modest level of institutional equity ownership. So stock investors seeking an informational edge should keep their eyes on junk bond prices on the heels of earnings reports. Now, if you don't believe me, perhaps you wish listening to Sergio Ermotti, the CEO of UBS's (UBS) investment bank, who has just admitted that the bank is having "one of the worst first-quarter environments in recent history"!!! If everything is so great, why does he sound so gloomy? Pay close attention to the "smart money" (bonds), and listen to the smart(er), more knowledgeable people. They are likely telling you the real story, a much more balanced and accurate story than the stock market is telling you. While stocks are rallying, bond yields and spreads are falling. Make your mind which side of the story you find to be more genuine, and a better barometer for what the near-future holds for us. The Wheel of FORTUNEis a most comprehensive service, covering all asset-classes: common stocks, preferred shares, bonds, options, currencies, commodities, ETFs, and CEFs. Model Portfolio, comprised of ETFs & CEFs; aiming at beating the S&P500 performance. "Getting Ready For 2019", a 19-part series, featuring our circa-100 top picks across eleven sectors plus eight segments.